Buying stuff on your iPhone(s appl) is about to become easier: Apple has added a feature to Safari in iOS 8 that uses the iPhone’s camera and optical character recognition to scan your credit card number instead of typing it in. Spotted by 9to5Mac, the new feature is similar to a method Apple provides for adding iTunes gift cards to an AppleID. 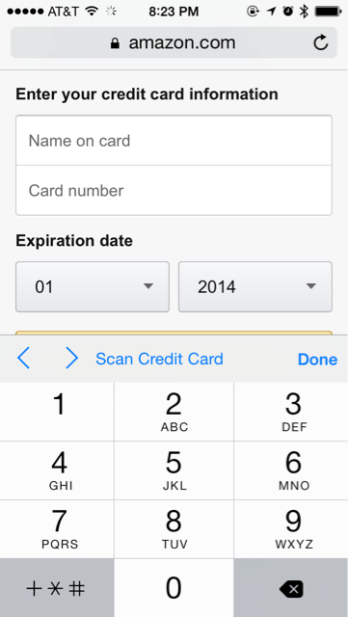 When it encounters an appropriate form online, Safari will detect that a credit card number is being requested, and the iPhone keypad will have an option to “Scan Credit Card.” The option also pops up for expiration date and CVV fields, but requires a separate scan. This feature has not been added to Apple’s other apps that can take credit card input, such as the App Store. Wow……..How cutting edge! Oh wait Google wallet already does this! Google Wallet and Safari browser are two completely different types of apps. BTW, you can scan codes in Passbook also. Hate much? I guess Google Wallet has to have something good going for it. With an unbelievably minuscule 50-100,000 users for Google Wallet (compared to Apple’s 800 million credit card enabled accounts), the mobile payments system that Google has been spending hundreds of millions of dollars on for the last 3 years, it has to be just about the biggest failure in Tech Industry history. Super awesome, so when I go to a restaurant, they can snap a photo of my card for their own use? Who wouldn’t want photos of their credit card floating around? My thoughts exactly. I wish they’d wait until the European style credit cards replace the obsolete thief-bate we Americans carry today. Or at least disable the feature in the US until such time as it’s not such an easy way to steal. they already can- this is just legitimate tools catching up to what hackers can already do with ease.